All at Avant-Gardening were delighted that the new bug hotel was recently installed in the Dream Garden pocket park. The bug hotel was visioned through a series of workshops and activities on the site before being designed and built by Thomas Cretton. Pupils from Snowsfields and Tower Bridge Primary Schools created individual rooms for the bugs so that the bug hotel will offer the latest in cutting edge interiors! The hotel rooms will be installed very soon. 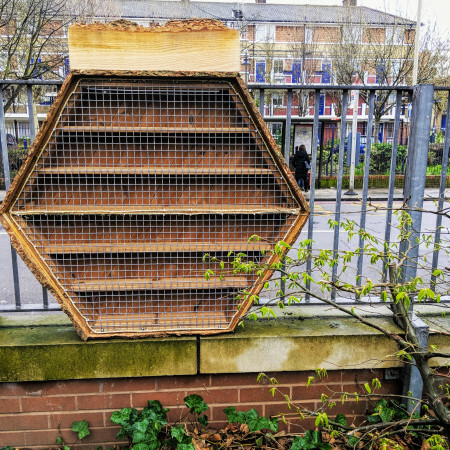 The bug hotel is part of the ongoing project to improve bio-diversity in the area, it will support insects which will in turn help with pest control and pollination and helping to keep an ecological balance. It is also going to be an integral part of our outdoor education programme which has also seen local schools bring groups of 20 – 35 children into the garden to explore the wildlife and help to imagine and design the future of the garden.